Observing the children play in the Tower Park Annanagar I was wondering how did we grow up to be like this? How did we who were born like monkeys grow up into staid and boring men or women? The children’s play area is full of slides, swings, see saws and jungle gyms. Watching the kids run around and play on these simple mechanical or stationary devices and having the time of their lives made me wonder if we stopped believing that life is not complicated at all and is all about simple little things. 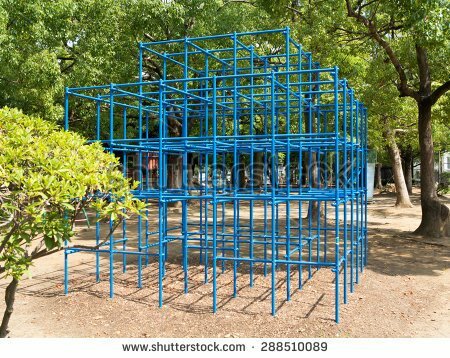 The biggest fascination for me was the many jungle gyms that had so many little kids on it. Climbing, swinging and jumping seemed to be the most basic of activities after walking and running. Every kid seeing a jungle gym even for the first time took to it like fish to water. I remember few years ago when my daughter climbed on her first one. The kids are excited and so much at home up there, climbing, swinging and at times falling only to pick themselves up and start all over again. As we grew up and other things occupied us we forgot monkeying around, we forgot getting down to the basics. These days Parkour sessions are slowly catching up and they are making an attempt to rediscover the skills that are inherent to everyone but are forgotten due to non-use. As we grew up we relegated physical activities to the bare minimum and its results are fairly evident: obesity, poor health are just a few. Next time we call someone a monkey, maybe we should pause and think if being a monkey is really such a bad thing after all.